Spots are still available for my Memory Box workshop being held on August 18th at The Ink Pad In NYC. Think outside the box by going INSIDE the box and creating a unique, personalized time capsule for your memories. You can read more about the workshop here. Art is...You is being held from October 4th to October 8th in Stamford, Connecticut. My workshop, 52 Card Pickup, is full. I will also be vending at the Art Trunk on Saturday, October 6th, an event that is open to the public even if you are not attending the retreat. If you have been thinking about attending the retreat, now is the time. 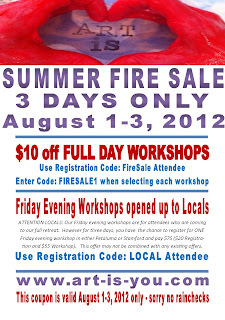 There is a fire sale ending today, August 3rd, where new registrations get $10 off full day workshops. 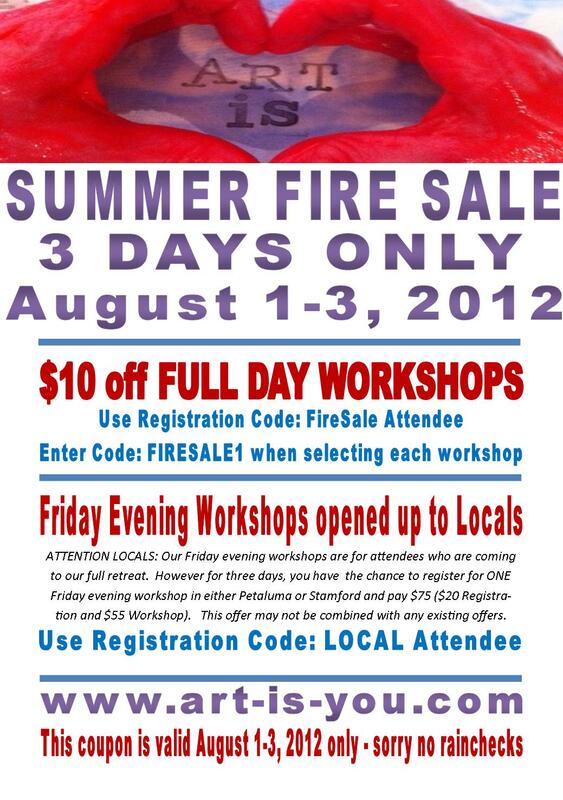 I am in the midst of planning my workshop schedule for 2013 now. Hard to believe, but next year will be here before we know it. In addition to applying to teach at three major retreats, I am planning numerous classes in NYC - including both multi-day workshops and multi-instructor workshops, and am scheduled to teach 5 workshops in the Northwest in the month of May. Please email me at shap97@gmail.com if you are a venue or know of a venue where you think I would be a good match. I would love to try to come to a neighborhood near you! really...you're coming back to the Northwest...will wait in anticipation of details! WHERE in the North West will you be teaching next year? Tell All! What an exciting schedule you have for yourself! It's all so exciting, Seth! I especially love the idea of your 52 Card Pickup workshop :) You are really enjoying the teaching, aren't you? Lucky participants!!! Venue Idea: Please consider "Small Studio" at Avon Lake. You probabaly already know of this place. Michael DeMeng was there this year, in a ddition to Teesha Moore, and Keith LoBue. Do you consider small workshops (about 16 people) in a lovely country setting? Example, a Bed & Breakfast. I'm describing the Orchard House Bed & Breakfast in Granville, OH. Granville is a college town (Dennison) and a couple of the residents are frequently in Cloth Paper Scissors and/or Country Living magazine. One artist is Amy Butler a fabric designer inspired by nature. Her husband paints. Anyhoo, I'm rattling because Granville is very close to Columbus OH....many artists there to rally at one of your workshops. I will be attending a writer's workshop at the B&B in October with author Wade Rouse. I can give you contact info if you consider something like that. The Midwest is lovely-particularly Chicago! Think you'd really like it here. Consider? when are you coming to florida - or texas? I'm going to second Darlene's suggestion! Granville is a wonderful place...and it's close enough to Cincy that I could make it!! Do give it some thought!! I think Zinnia would be a lovely place to give a workshop! And convenient located to one of us! !